Microscope objective lenses sometimes have special uses. 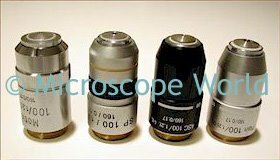 Below you will find information on some of the inscriptions that you may find on your microscope objective lenses. NIC - this objective lens is preferred for use with Nomarski microscopy. DIC - this microscope objective is used for differential interference contrast. UV - Ordinary glass is relatively opaque to ultraviolet light wave lengths below 400 nanometers. UV objectives contain specially formulated glass elements and coatings in order to transmit a relatively high percentage of light of such wavelengths. These particular microscope objectives are useful for near ultraviolet excitation in reflected light fluorescence work. PL or NH inscription on a phase contrast objective - PL stands for positive low, a phase contrast example in which the specimen appears darker than the background of the field of view. NH is less commonly used and it stands for negative high. Negative high is a type of phase contrast where the specimen appears lighter than its background. POL or SF - the microscope objective is strain-free and is required for high quality polarized light microscopy.